Sue Johnson, installation view of Asphalt, 2013. Photo by Christine Carr. Artist Sue Johnson’s fall exhibition provoked questions about Americans’ love of consumption. For artist Sue Johnson, mid-century modern means the promise of domestic perfection. In American Dreamscape, her three-part exhibition on display last fall in the Eleanor D. Wilson Museum, she explored the primary sphere of 1950s women—the family home—taking into consideration the business of advertising that was flexing power over the middle class, emerging after World War II with a thirst for the new. Walking among the rooms of Johnson’s oversized “dollhouse,” titled Ready-Made Dream and constructed in the largest of the three gallery spaces, viewers saw art imitating life. Enormous, flat vistas of stereotypical interior scenes covered the walls. Using digital collages, Johnson mixed hand-drawn artwork with magazine cutouts from the period and other source material to reimagine rooms based on the lithographed metal dollhouses of the 1950s. Printed on heavy vinyl at a scale larger than human size, the room designs gave visitors the feeling of being slightly dwarfed by their surroundings. Initially, the nostalgia and humor of Ready-Made Dream kept viewers from feeling intimidated, but as they walked from room to room, guests often began to feel overwhelmed by the sheer quantity of stuff: every shelf crammed with knick-knacks, walls covered in busily patterned wallpaper, and the pantry overflowing with everything from mustard to car tires. Sue Johnson, installation view of Banqueting Table with King of Happiness Hill, 2013. Photo by Christine Carr. When Johnson visited Hollins’ Wyndham Robertson Library several years ago, she viewed accordion-fold books in the library’s special collections and became entranced with a book called Japanese Orthodox Flower Arrangement. This volume, published in 1938, introduced traditional methods of floral arrangement to an American audience. The book’s authors directed American women in the art of formal interior design to beautify their homes. 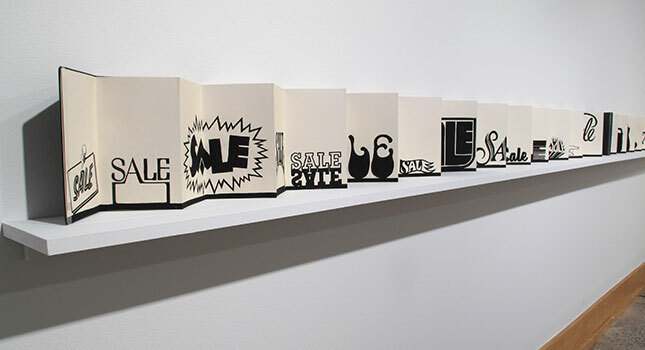 In creating Asphalt, her own series of accordion-fold books, Johnson similarly represents advertisers’ suggestions on ways to improve the home life of women—ideas based, of course, on consuming: buying items on sale, for example, entertaining their children with Bambi, and preserving foodstuffs in Tupperware. The title refers to the thick black line running along the bottom edge of each book’s pages. Just as the United States highway system connected people, places, and ideas, the line in Asphalt links silhouette to silhouette, logo to logo, and implies a network of consumption. The images are contemporaneous with the highway system: Created after World War II, they are relics in our modern world. At the entry of the museum, Johnson laid out her Banqueting Table. Plates and platters of food greeted viewers, who had to move closer to see which settings were depicted in two dimensions on top of the tablecloth and which were three-dimensional ceramic and assembled pieces. Showing her sense of whimsy, she presented Butterside Up Doughboy and Blue Plate Special: Dory with Dirty Rice as part of the meal. 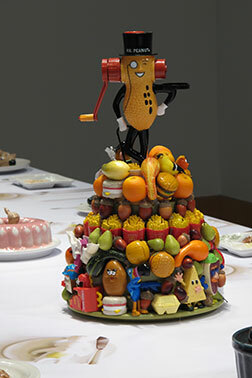 Mr. Peanut, atop a mound of fast-food toys, reigns as the King of Happiness Hill. Viewing this table, guests could question what they are being asked to consume. Throughout the exhibition, Johnson’s imagery was familiar and recognizable, thanks to the pervasiveness of advertising. American women and men are still being told how to achieve the modern ideal: Buy that, eat this, act this way. Advertisers continue to tantalize potential customers with promises that their products will provide the convenience, time, and pleasure that can enable us to have it all. No matter how pretty the packaging, Johnson reminds us, it’s time to question what we’re consuming. Laura Jane Ramsburg is manager of museum operations for the Eleanor D. Wilson Museum. The exhibition was curated by Amy Moorefield, former director of the museum. Learn more about the exhibition by watching this video.